I don't wear alot of jewelry, those who know me always see me in dainty earrings and a watch with a dainty necklace. 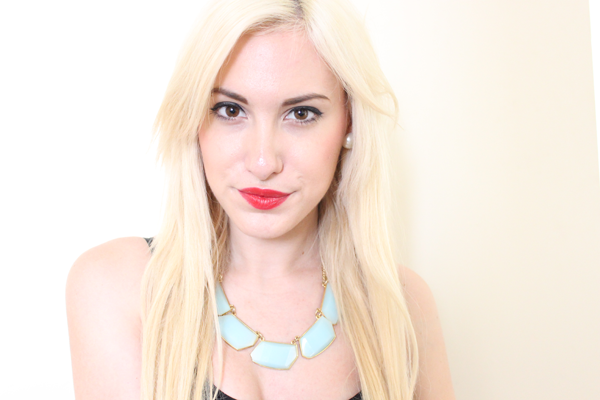 Then there are the odd occasions where i'll wear a statement necklace. The Lovely Lindi from Lindi's Delicate Edge on Etsy has a range of Jewelry and was kind enough to send me one of her pieces to review. The Pastel Blue and Gold Resin Stone Necklace ($14)* caught my eye immediately as It was nothing I had owned and knew it would be a key piece to own. I love blue and turquoise so I knew it will be used more often. I came home to a gorgeous Pink Bubble wrapped bag and inside it was wrapped in colourful animal print wrapping. Need I say more, I was already in love with her business! 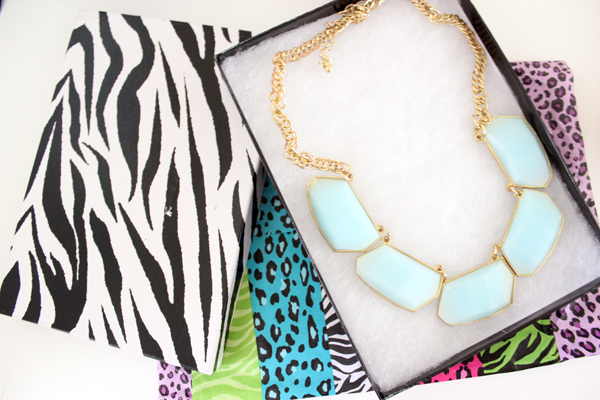 On opening I found a Zebra Print Box and inside was the lovely necklace underneath a thick layer of bubblewrap which is great when you are getting items in the mail and you really don't want anything to break. The gorgeous Necklace itself is stunning. I got so many compliments on it as it's a great eye-popper and many just love the colours of the stones. JUST A TIP: Keep away from Perfume and Fragrances, a little mistake that i did was spray very close to the necklace and It reacted to the gold at the back of the necklace. 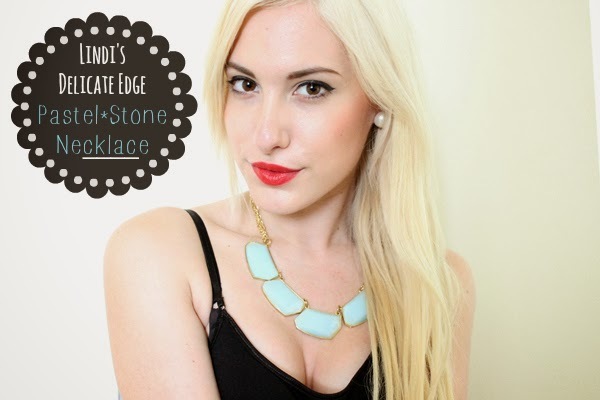 Where to find Lindi's Delicate Edge? WHAT IS YOUR FAVORITE JEWELRY PIECE? SHARE YOUR THOUGHTS AND LET ME KNOW IN THE COMMENTS BELOW! Awhhh Thanks Laura!! You're such a babe! !